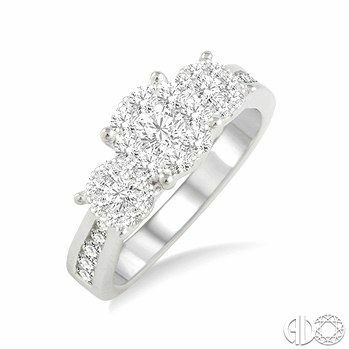 This captivating lovebright diamond ring will make your love more special for her. Beautifully crafted in cool 14 karat white gold, this ring features a trios of framed round diamond arrays arranged side-by-side along the shank. Additional diamonds line the shank. 39 round cut diamonds are set in invisible, channel and bezel set. Total diamond weight is 1/2 ctw. Diamond Color is H-I and Clarity of SI2-SI3. Sterling Silver with Synthetic Diamonds Bridal Trio.